This serial publication endeavors to keep information professionals abreast of developments in the field of grey literature. 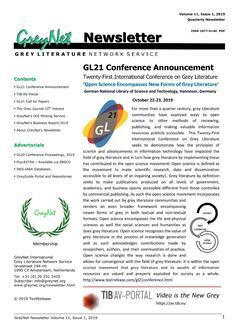 The quarterly newsletter gives exposure to GreyNet’s information resources and frontline activities with special emphasis on the International Conference Series on Grey Literature. The GreyNet Newsletter is licensed by EBSCO Publishing and can also be accessed via the Library, Information Science & Technology Abstracts (LISTA-FT) full-text database. This serial publication is made possible through the support of GreyNet’s Associate Members and Corporate Authors: DANS-KNAW (Netherlands), CVTISR (Slovak Republic), ISTI-CNR, (Italy), Nuclear Information Section, NIS-IAEA (Austria), Inist-CNRS (France), University of Florida, George A. Smathers Libraries (USA), National Library of Technology (Czech Republic), EBSCO Publishing (USA), Korea Institute of Science and Technology Information, and TIB (Germany).